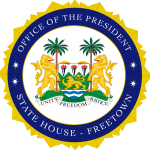 State House, Freetown, Thursday 24 January 2019 – His Excellency President Julius Maada Bio has unveiled the ‘Transform Freetown’ initiative by Freetown City Council (FCC), expressing his excitement about central government’s involvement because the blueprint aligns very closely with the New Direction’s priorities and vision. “PAOPA, our Freetown will be clean. So within the last 8 months in governance, my government has supported the Freetown City Council with direct financial disbursements of 18.3 Billion Leones. My government is committed to working for Freetown and in making our Freetown a better city for all of us,” he assured. President Bio also asked questions, in the form of well-intentioned suggestions, about FCC’s proposed plans on municipal assets, congestion in the city, disaster management during the rains, leveraging ICT to boost revenue mobilisation, promoting tourism and the informal settlements as they relate to bigger issues of social exclusion and social injustice. “In the past, we saw how municipal assets were illegally appropriated by the politically powerful and their rogue agents. My question is, does the initiative aim to recover those assets?…And is it not possible to plough back proceeds from value-added city assets into the development of the city especially in new infrastructure for sewage disposal, water supply, and sanitation?” he asked. “We want to ensure that by working with the central government Freetown will be restored to its lost glory. The Freetown City Council has sought to align its agenda with that of the national development plan,” the Mayor said, adding that they wanted to create the necessary jobs within Freetown that would deter the youth from embarking on difficult migration journeys. He also recognised that key progress was being made by the FCC and thanked them, in particular, for automating the local tax collection system. He commended the President for reintroducing the monthly cleaning exercise, which he credited for reducing cases of flooding in the city, adding that developing Freetown was imperative because it accounted for 30 per cent of the country’s Gross Domestic Product.